Saint Anatolius was a priest from Alexandria, who had been ordained deacon and perhaps also priest by Saint Cyril, Archbishop of Alexandria. In 449, at the Robber Council of Ephesus, Saint Cyril's infamous successor, the violent Dioscorus, unlawfully deposed Flavian, the Patriarch of Constantinople and opponent of the Monophysite Eutyches; Flavian, from the beatings which he received, died soon after. Dioscorus, thinking that the priest Anatolius would support him, consecrated him Patriarch of Constantinople in Saint Flavian's stead. After he had been consecrated by Dioscorus-who at that time had not yet been deposed-Anatolius united with the Orthodox; before the Council of Chalcedon in 451, he held a council of the Bishops in Constantinople, at which the Orthodox "Tome" of Pope Leo (see Feb. 18), which Dioscorus had not allowed to be read at the Robber Council, was read and approved; and at the Council of Chalcedon in 451, he condemned Nestorius, Eutyches, and, for his unlawful actions, Dioscorus. Saint Anatolius reposed in the year 458. Some ascribe to this Anatolius the hymns of Vespers and the Praises in the Octoechos that are labeled Anatolian Stichera; but others (which may be more correct), to another with the same name, who was from the Monastery of Studium, and a disciple of Saint Theodore the Studite, whose epistle to this Anatolius is still extant. 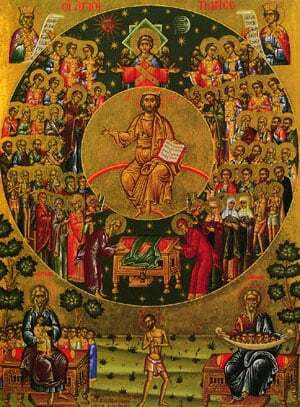 Share the feast of Anatolius, Patriarch of Constantinople with an icon greeting ecard.